He appeared to the mounain ascetic En no Gyooja and is enshrined in all mountain temples that he build in his honor. The most famous are Yoshino, Ishizuchiyama and Mitoku San. 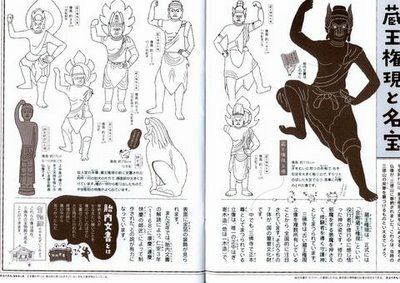 Zao Gongen can be imagined as a deity inbetween the inherent Shinto Deities of Japan and the Buddhist Deities imported from Mainland China. 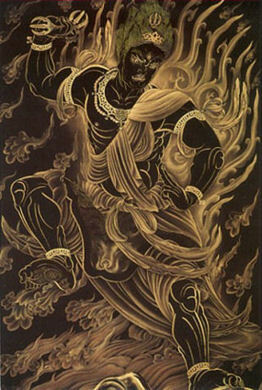 Zao Gongen is ordinarily represented with the third eye on his forehead, his hair standing up, holding up a three-pronged Vajra (the weapon with diamonds), wearing an animal skin, with an expression of rage, with one leg raised while the other is placed on a rock. 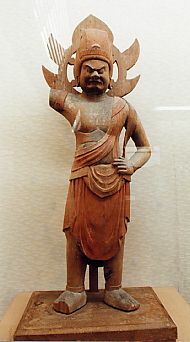 When En no Gyoja prayed for a deity to help safe Japan from its woes, first Shaka appeared, but that was not powerful enough. Then a Kannon with 1000 arms appeared, but that was not powerful enough. Finally he prayed again and Zao Gongen appeared, as an incarnation of all the Buddhas and Shinto Deities. So the three Gongen statues at the temple represent these three deities. 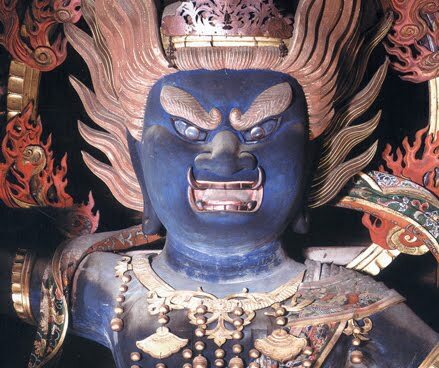 The syncretic nature of Japanese religious life is evident in the icons and practices associated with the deity Zao Gongen, the abiding spirit of Mount Kimpu, in the Yoshino Mountains south of Nara. Zao was the protective deity of Shugendo, a Shinto-Buddhist cult devoted to ascetic practices and mountain worship. Images of him are based on the vajra-bearing guardians of the Buddhist pantheon. This finely cast bronzed image of Zao Gongen expresses the fervor of his cult in the latter half of the Heian period, as well as the refined aesthetic sense of the Fujiwara aristocrats who were its most powerful adherents. 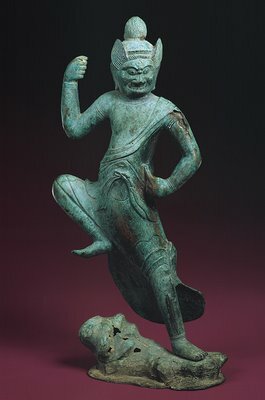 Poised on one leg, Zao brandishes a now-missing vajra (thunderbolt scepter); his might and ferocity are rendered in a sensitively modeled form embellished with delicately chased designs on the windswept garment. 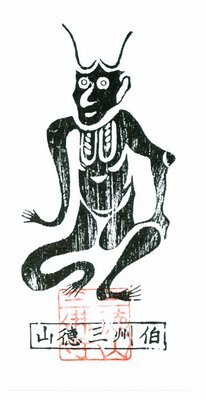 This icon was probably placed in a grotto similar to the one in which it was discovered in modern times, still worshipped, in a village on the Japan Sea north of Kyoto. Click on the photo for a larger version, it takes some time to upload. The Cherry Tree is the holy tree of Zao Gongen in Yoshino. Ein wilder Bosatsu, der sich um 660 dem Bergheiligen En no Gyooja nach 1000 Tagen der Askese auf dem Berg Kinpusan in Yamato (Zentraljapan) offenbarte. 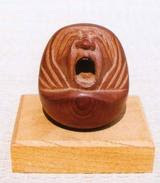 Er entstand wohl aus der Verschmelzung des ursprünglichen Bergglaubens und der buddhistischen Gottheiten und ist Hauptgegenstand der Verehrung der Bergasketen im Yoshino-Tal (Yoshino shugendoo). 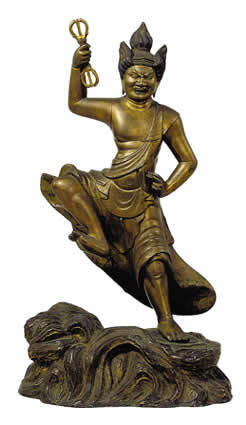 Miroku Bosatsu (Zukunft). 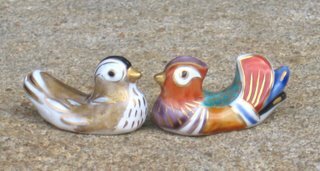 In dieser Form ist Zaoo Gongen auch identisch mit Dainichi Nyorai. Furchterregender Gesichtsausdruck. Ein Kopf, drei Augen, zwei Arme. Haar steht nach oben ab. In der rechten Hand hält er hoch erhoben einen Donnerkeil, die linke hält er in Höhe der Hüfte, mit ausgestrecktem Zeigefinger und Mittelfinger etwas nach oben weisend. 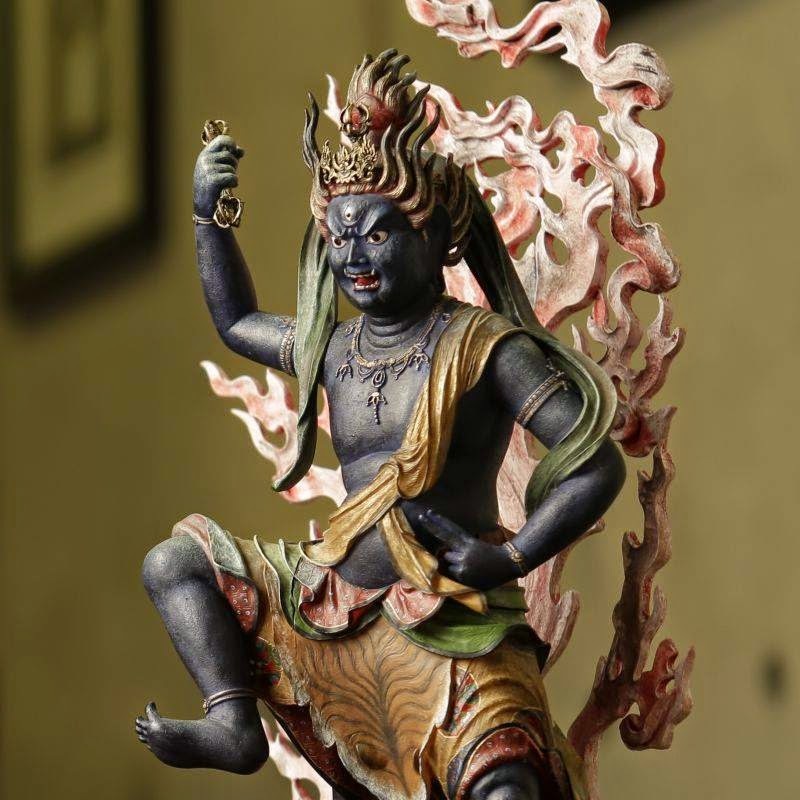 Der rechte Fuß ist in einem Ausfallsschritt (choojidachi) hoch erhoben und gibt der Figur einen besonders dynamischen Ausdruck.
. Kawabata Ryuushi 川端 龍子 Kawabata Ryushi .
. Noten Okami 脳天大神 and Yoshino . 「福は内、鬼も内」- Fuku wa Uchi, Oni mo Uchi! 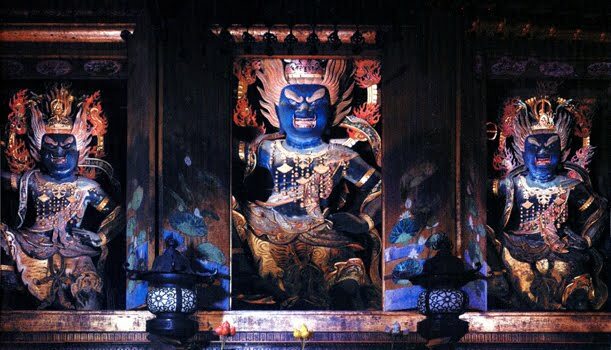 All the demons that are driven out at Setsubun come here for a rest. They have a change of heart and become benevolent Oni afterwards.